Thank you for waiting so patiently, Ducky! It is indeed now your turn, yep, yep, yep! In this topic please feel free to discuss Ducky as a character, to share your own creations (fanfics or fanart), or to mention some of your favorite fanworks of others involving this character. For a full set of rules please see the Monthly Character Showcase topic but keep in mind that this is meant to be fun as opposed to any sort of contest. Just to get things started I will pose an initial series of questions to the Ducky fans on the forum: What are your thoughts on Ducky? Also, how do you think she has developed over the course of the original film and sequels? Rhombus: We will also change up the Ducky icons a bit later. Likewise, this showcase will be announced in the news banner beginning on 4/2/2019. Although Chomper is my favorite character, Ducky is my favorite character out of the original gang of five as well as my 2nd favorite character overall. I just really like Ducky's personality and her overall attitude. Her character also seemed to stay consistent throughout the series with the possible exceptions being The Big Freeze and Search For The Sky Color Stones episode. Plus I'm Facebook friends with Aria Curzon (and her mother) so that could also play a part in my liking of Ducky. Also both Judith Barsi (RIP) and Aria were outstanding in their portrayal of the character. First off, if you tell me that she doesn't have a crush on a certain flyer she's known since the first movie, I laugh at you. You'll NEVER change my mind, so don't bother trying. Anyways, I've loved her since the start. Such an upbeat attitude I can't help but love. Not to mention I have always loved her catchphrase. Yep! Yep! Yep! There is no doubt that she loves her adopted brother. Spike is pretty lucky as far as I'm concerned. What I'm surprised with is how many brothers and sisters she has. I mean, she got some new ones at the start of the last movie. I question how many babies her species has in a lifetime. Maybe it's a blessing she fell for someone outside her species. Still, love her and I wouldn't want her to change in any way. Ducky always used to be my favorite character. She is simply adorable. 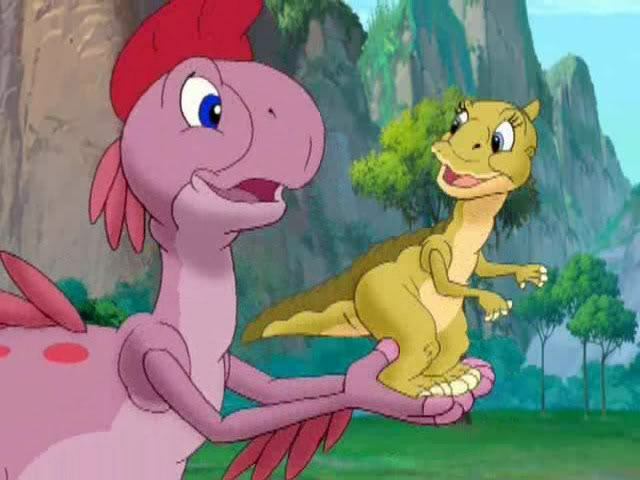 She seems to care so much for everything and everyone around her, clearly shown by her adopting Spike and the tears she shed after 'losing' Petrie. She might be a bit on the naive side, but sometimes it is good to have innocence and naivety in a group with so many mixed personalities. I absolutely loved drawing her 10 years ago. She was featured in the first fanart drawings I made and is the only one I ever drew in a whacky out-of-character setting (I currently have it as my avatar, but you can check it out here in all it's glory ). In fact, I'm working on something related to Ducky right now! We also definitely need more Ducky emotes, this can't be the only one! What really invests me in Ducky is her real-life story. The tragic loss of her original voice actress has always had a big impact on how I view her character. That little girl did such an absolutely wonderful job, and for her to be taken away like that is just... I'm really glad we have Ducky, and other characters she voiced, to remember her by. Yep! Yep! Yep! Ducky is just epitome of adoration, cuteness, goodness and kindness. It automatically makes her one of my favorite. I like such people in real life, I believe if our world had a lot Ducky's goodness, it would be better world. At the same time though, someone or something breaks cutie, and she acts with anger or bad emotions, in IIX, XI, TV series. There's situations in real life when you just have to act rough and hard (justified moments), so when someone like Ducky does it, it doesn't spoil person (if it wasn't pure vile actions of course), but only makes it wide and interesting to see. methink. Quote from: pokeplayer984 on April 03, 2019, 05:48:44 pm First off, if you tell me that she doesn't have a crush on a certain flyer she's known since the first movie, I laugh at you. You'll NEVER change my mind, so don't bother trying. Finally, there's someone on the forum I know who's a shipper of that couple! Believe me, I'm a proud shipper of those two, I've been one since I was a little boy, and I always will be! I often like to call her the Happy Hadrosaur or Sweet Swimmer because she has that personality we all love to love! Just imagine her walking right up to you and you see that cute smile on her face and listen to her sweet voice. You would want to relish the moment forever. I don't know what they were thinking with that Sky Color Stones episode, and as a matter of fact, Aria Curzon herself admitted that she disliked the way her character behaved in The Big Freeze. At least I can say she showed just a bit of crucial character development in that film. And don't get me started on the tragedy that marred her character history before the first film was even in the theaters, as if Ducky was born destined to be the character forever marked by a tragedy that could ruin the childhoods of many LBT fans. Then again, I don't think anyone can have a conversation about Ducky without the terrible subject of Judith Barsi being mentioned by one or the other. Btw, where is old good Ducky icons? Or did Cera threaten Ducky and memebers of Rock Circle that if they remove her icons they would have a bad threehorn time? Quote from: Sneak on April 04, 2019, 12:10:03 pm Btw, where is old good Ducky icons? Ducky is, in my opinion, probably one of the cutest characters out there. she kind of represents the innocence of childhood to me, what with her constantly playful and happy attitude. I always found my heart rate increasing every time I saw ducky in some sort of peril (thanks a lot, Journey through the mist! ), I guess that's the same reason I can't bring myself to read that "swimmer trials" fanfic...oh well. she'll always be one of favorite characters in pop culture! Here's an image of Ducky's loving family before she was born. This was made for the Fanart Prompt, but also fits well with this month's character! What is this red part on this picture? I can't recognize. Beautiful work, Mumbling! It'll be intriguing to see your future works on the forum! Though Ducky has never been my favorite, her positive attitude is always a welcome site in the gang. Hard to mention anything that hasn't already been said. I'm also behind on my fanart prompt and haven't thought of anything clever this time around but at least I have an old sketch of Ducky that I did for practice a year ago that I can share. ^ Ah, that looks good. I wish I could be so creative with my drawing, but alas, I don't got the skill or the patience for it. Well, that might be true. I've never really given drawing much attention before in my life. Who knows? I might see how I do. 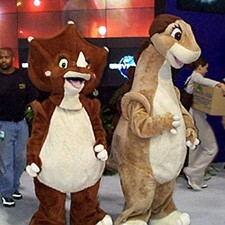 Ducky has always been my favorite dinosaur ever since I watched my first LBT movie, yep yep yep! I just love her upbeat personality, optimism, cuteness and her relationship with Spike. I also identify with her as far as being optimistic, cheerful and caring. We definitely need more Ducky emoticons, since the only one right now is . Thanks guys. The drawing was was referenced by official art or something so I wasn't coming up with anything unique for that one, mostly just practicing proportions. But yeah Anagnos I would say give it a shot, you might end up enjoying it! It's a lot of fun seeing what people come up with! 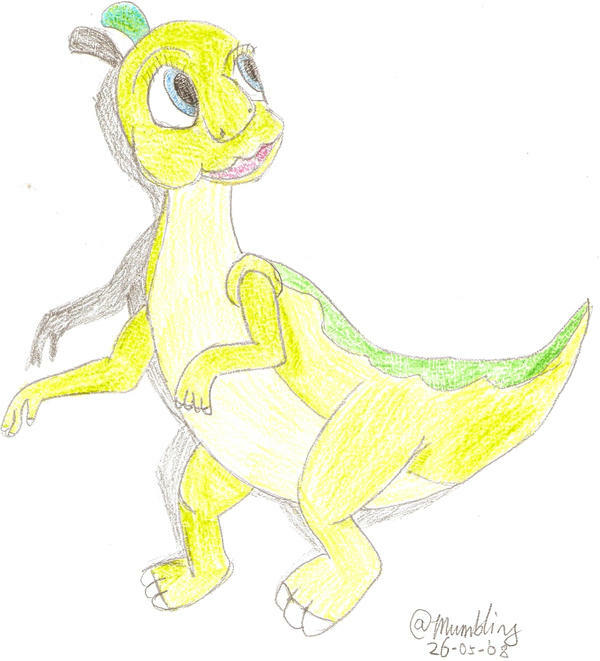 And Iris, that's actually pretty good for a first drawing of Ducky! It may not be completely accurate but the proportions seem about right. Also yep, a real lack of Ducky emotes right now. Got an emote contest right now but it's a crying one so maybe not the best one for her?